The Wall Street Theater has enjoyed an illustrious history, involving numerous prominent community members and physical renovations, along with several transitions in identity in its time. Originally purchased in 1914, by Samuel Kantor, The Regent opened it’s doors in September 1915 with a production of Henry Wilson Savage’s Everywoman and an appearance by Earle Williams, who was voted “America’s Number One Star” that year. The Regent featured live vaudeville acts and the biggest “talkies” of the era, and showcased a large colorful marquee at the front entrance, which has since been removed. The Regent hosted many important performers and occasions. John Philip Sousa, Lillian and Dorothy Gish, John Barrymore, Mary Pickford and Ruth Chatterton are just some of the stars that graced the stage during it’s first decade. Used not only for performances, the theater would become a place for community and political events, including an an inspiring Republican rally on October 29, 1920 where Connecticut’s senior member of Congress, Senator Frank B. Brandagee spoke enthusiastically to a record crowd concerning his opposition to the League of Nations. Years later, the Great Depression struck the country and The Regent lost revenue as audiences waned and funds to pay performers became sparse. At that time, it made sense to convert the space into a movie theater, which would offer a much more affordable entertainment experience to the community. Additionally, the population of the city was increasing, establishing the need for modern amenities. Thus, in the 1930s, and after several weeks of complete remodeling, The Norwalk Theater opened as one of the finest theaters in New England. It enjoyed capacity crowds during its inaugural night, debuting two hit pictures of the time “The Story of Alexander Graham Bell” and “Everybody’s Baby.” At the time, the theatre was operated by M. and P. Theatres Corporation and Connecticut Mutual. New seats, new sound tracks and decorations were just a part of the unveiling. It lasted for nearly 50 years, playing double features to satisfied moviegoers, marking one of the ways in which the city was greatly advancing. Though the community was excited for a new moving picture theater, many had worried that after so many renovations, the theater would simply become a beautiful example of historical architecture with little patronage or consideration given by the community. However, it was eventually the altered structure of the roads and the traffic pattern in downtown Norwalk that led to the Norwalk Theater’s demise, as less daily attention was paid to the building. Therefore, it once again grew less prosperous, especially as other theaters and movie houses sprung up in town and it suffered to its more accessible competition. 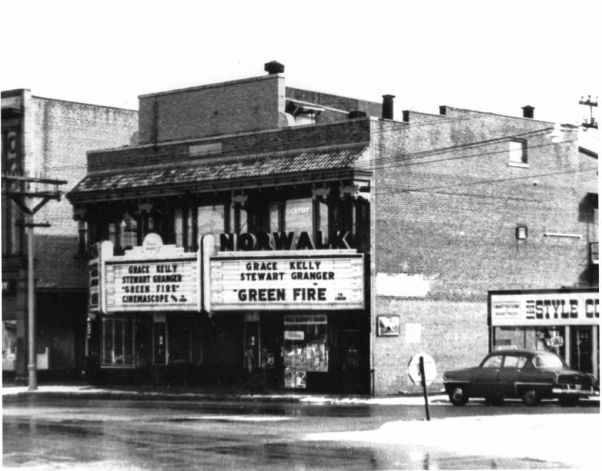 The Norwalk Theater closed in October of 1989 with a showing of the martial arts film Kickboxer. After several years of attempted revivals, the theater finally reopened as a music club on May 29, 1993. Known then as The Marquee, it was run by well-known music impresario Robert Ellis, who had successful ventures in New York City. Acts such as Wu-Tang Clan, Living Colour, Concrete Blonde, Primus graced the stage. After just a year, The Marquee ran into financial difficulties and closed it’s doors. In July of 1994, local entrepreneurs Brendan McGee and brothers TG and Jason Diamandis opened the theater once again, this time as The Globe Theater. For most of the 90’s, the theater played home to many national acts including David Lee Roth, Live, The Go-Gos, Violent Femmes, Waylon Jennings and The Mighty Mighty Bosstones. Additionally, The Globe took the opportunity to focus on developing local and regional music, and became a hotspot for bands that would go on to later achieve national success. In 1999, C. B. Enterprises bought the property and transformed it into The Roxy. Under new ownership and a fresh name, The Roxy offered a dance club environment in this new rebirth, operating under state-of–the-art laser lights that pulsated to high-tech sound entertainment, keeping pace with the latest trend in use of theater space, but retaining its original, historical character with virtually little renovation work done. “Years ago, people went to the theaters for a stage performance; now it’s high-tech lighting and sound, but it is still entertainment times have changed, that’s all,” said James Brown, of C. B. Enterprises, which opened The Roxy club and also owned several dance clubs in New Haven and Hartford counties, such as: Club 2001, Club Liquid and Club Avalon. Today, the theater will see yet another reincarnation—as a 501c3 non-profit organization, one of large proportions that will fill the needs of the community, a place which can grown into a thriving downtown marketplace. The Wall Street Theater adopts its moniker from its location and its mission from its history, combining live shows, interactive entertainment, cinema, digital production, art space and a community arena in which to play. The Wall Street Theater is poised to be the where-to-go destination in downtown Norwalk, if not all of Connecticut.